Now that you have the model of your teeth looking pretty vampirish it’s time for yet another impression! We’re going to take an impression of your model (for reasons we’ll explain later), but there is one important step at this point. 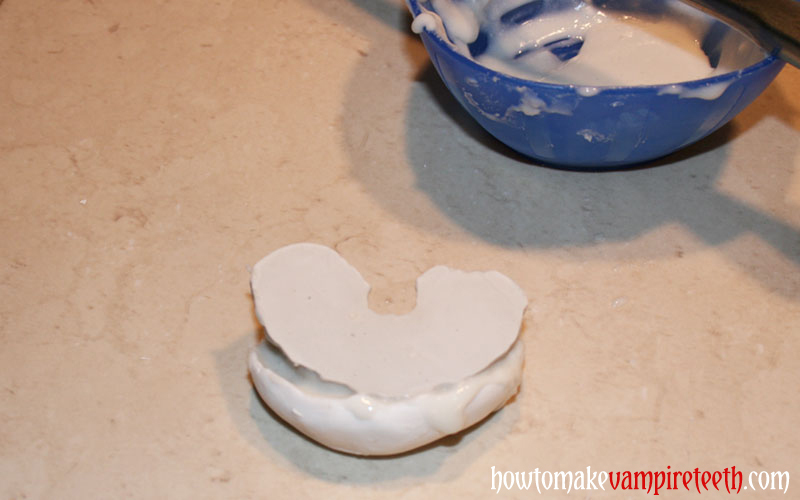 Get a bowl of soapy water (dish soap would work best) and gently place your cast and molded fangs into it. Let it sit for at least 10 minutes. This will enable you to take an impression of the model without the impression material sticking to the cast. Don’t forget this step! 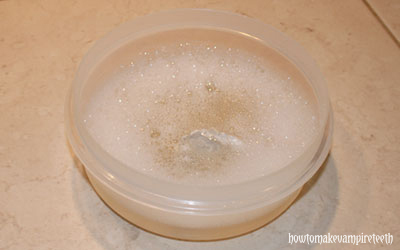 Next mix up the impression material just like we did before, put some in your custom tray again, and very carefully stick your model into the goop. Let it set up and remove the model. 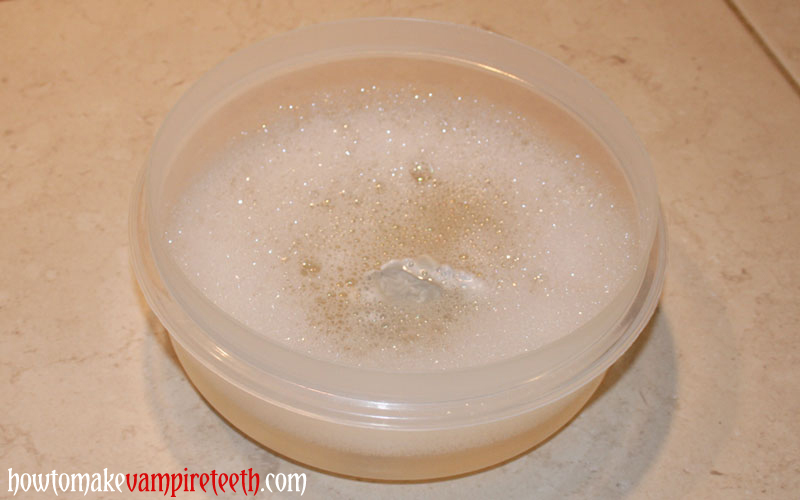 The impression material should be thin enough that it won’t smoosh your fangs as you carefully press it into the tray. Don’t push it all the way through the impression material or the tray will definitely do some smooshing. You may have sculpted a much more intricate and fragile design with your teeth. If the impression mashes your sculpted teeth you might want to consider baking the model. One great feature of Sculpey clay is that it can be hardened with a quick trip to the overn. The only drawback to this is that you won’t be able to remove the fangs from the model, which you’ll need to do later. If you have a second model of your teeth this won’t be a problem. Examine your impression once again. Make sure you have a very detailed impression around your fangs. 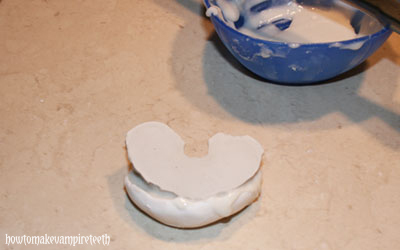 If you used a plastic custom tray, make sure there are no voids that expose the tray. 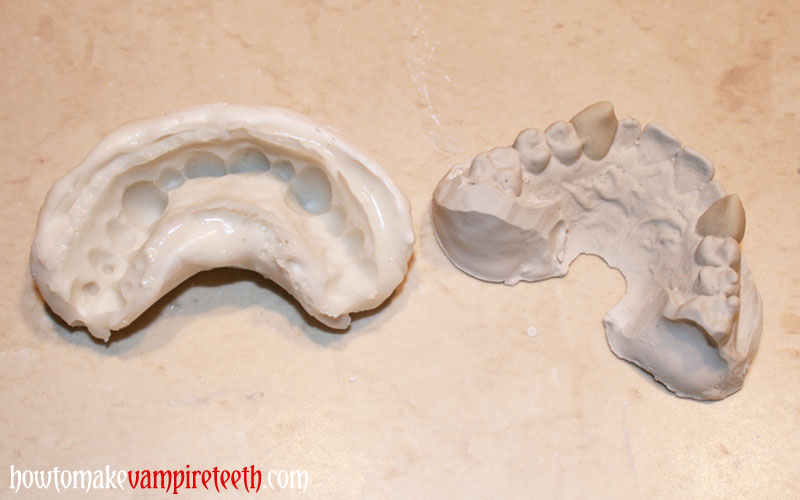 In the last step you’ll use acrylic to make your fangs and if the acrylic comes in contact with the tray it will fuse to the tray and likely ruin all your hard work.